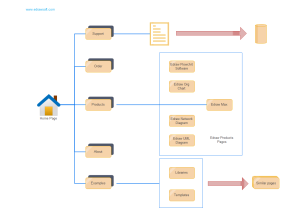 This article shows you how fast it is to make a conceptual website diagram by applying Edraw - just a few drags and clicks. You can handle the software as easy as flipping hands but your achievements will be compelling and effective. Step 1. On the File menu, point to Wireframe, and then double click Conceptual Web Site. Step 2. Drag the Home Page shape onto the drawing page from Conceptual Website Shapes. Drag other shapes onto the drawing page according to your website structure. Step 3. Click the Connector tool (on Home menu, in Basic Tools group). Step 4. Move the pointer towards the shapes you want to connect. Step 5. When the connection point shows, hold the left mouse button down, drag it to the connection point of another shape and then release the mouse. Continue connecting shapes until you've completed your diagram. A conceptual website template has been meticulously designed, aiming to facilitate your designs and enhance you presentation effect.